Welcome to beautiful, snowy Skyrim. Here, have some Nord mead. Go ahead, get comfortable — we're going to settle in by this fireplace for a nice, long chat about choosing the race for your character. We want to make sure it's a good fit, and there are several considerations. The first thing to know is that the Health, Magicka and Stamina attributes are all still there. Right on the heels of that, however, you need to know that the traditional Elder Scrolls attributes of Strength, Endurance, Intelligence, Willpower, Agility, Speed, Personality, and Luck are gone. Leveling also works a little differently. In Skyrim, you gain experience points for using any of the 18 skills. These skills are separated into three sections of six each. The Magic skills include Alteration, Conjuration, Destruction, Illusion, Restoration and the crafting skill of Enchanting. Combat skills cover anything that causes an enemy damage, other than magic: Archery, One-Handed, and Two-Handed. Block and Heavy Armor are also included in this section, as is the crafting skill of Smithing. Stealth skills pick up the balance: Lockpicking, Pickpocket, Sneak, Speech and Light Armor are all here, as is the crafting skill of Alchemy. Wait, Alchemy in the Stealth section? Yes, we know. But Alchemy is useful for creating a huge number of weapon poisons, and that makes sense for a stealthy character. Besides, it was the only crafting skill left. Anyway, instead of any kind of class, archetype or set of primary skills, each race will have two-three unique abilities and bonus to a set list of skills. Each race gets +10 to one skill, and +5 to each of five others. Use a skill and you will earn experience in it until you reach a new level; after 10 skill levels, your character level will increase by one. That could be 10 different skills or just 10 levels of Sneak; doesn't matter. The caveat here is that you can still exploit your skills through the roof, either by sneaking everywhere you go, or by spamming a cheap Resto or Illusion spell on yourself. However, doing so will severely gimp your character. You'll end up with a level 10 character with 100 in Sneak and no combat skills to speak of. Leveling isn't as boring as the above makes it sound, however. At each character skill increase, you'll gain access to a "perk." These perks are a little like those in Bethesda's other RPG series, Fallout; the difference is that Skyrim perks are in constellations according to skills. You can use your perk to improve the outcome of enchanted weapons and armor, to make picking Novice locks a little easier, or to add damage to sneak attacks with your bow or one-handed sword. Because the perk constellations work like trees, you must advance up the path; it's not possible to take the first perk in a skill, skip two, and then take the fourth. The second perk becomes available once you've invested in the first, then the third once you've taken the second, and so on. The perks also have a skill level requirement that must be fulfilled in order for a particular perk to be available to you. The Altmer have always been known for being a little superior, and that holds true for those residing in Skyrim. Here, you'll find Altmer in places of power, sneering down upon the Nords who want to keep Talos as one of the Divines. Members of the High Elf race enjoy a bonus of +50 to their Magicka pool, along with the "Highborn" racial ability. Once each day, an Altmer can bump his Magicka regeneration up significantly for 60 seconds. Don't worry about their fabled vulnerability to enemy magic; that's gone. On the flip side, they're also no longer resistant to diseases. Altmer begin with +10 to the Illusion skill and a +5 bonus to Alteration, Conjuration, Destruction, Enchanting and Restoration. If you're thinking "pure caster," you're on the right track. 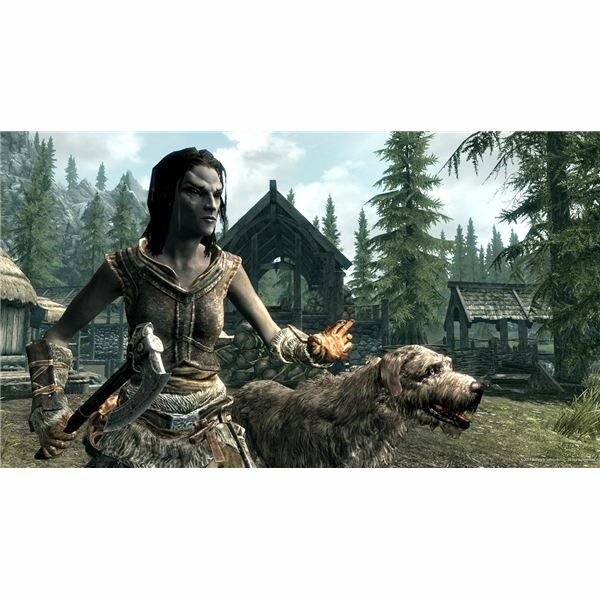 The Altmer also possess a natural ability to incite Fury in people and animals up to level six. One of the two playable beast races in Skyrim, Argonians are treated with a modicum of distrust by the native Nords. In return, most Argonians are slow to trust anyone else. They have racial traits that allow them to breathe underwater and to resist diseases, and once each day they can activate "Histskin," a racial ability that substantially increases their health regeneration for 60 seconds. Argonians come into being with a natural lean toward Stealth. They have +10 to Lockpicking, making them a sure bet if you want to be able to get into everything. They also enjoy +5 bonuses to Alteration, Light Armor, Pickpocket, Restoration and Sneak. Argonians are natural thieves, as you can see, but they can also call upon the arcane arts for self-healing and for spells that increase their armor rating, Paralyze their foes and add light to the darkest dungeons. Elves from the wooded region of Valenwood are referred to as Bosmer, or Wood Elves. These Elves are typically a bit smaller in stature and are much more in tune with nature than either the Altmer or Dunmer. Bosmer characters will find things a bit chilly in Skyrim, and not just from the snow on the ground. Neither the native Nords, nor the haughty Altmer, or even the more tolerant Imperials will be willing to put much faith in you. With their natural affinity, Bosmer are able to resist both poison and diseases. They can also call upon an animal once every day for a help in a fight. Natural-born rangers, Bosmer begin with a +10 to Archery. A Bosmer without a bow is a sad Elf, indeed. They also gain +5 to Alchemy, Light Armor, Lockpicking, Pickpocket and Sneak. A Wood Elf is the quintessential rogue, stepping out of the shadows only long enough to swipe a key or plant a poisoned arrow in his enemy's back. The Bretons are humans native to High Rock and it can be a bit difficult to discern them from Imperials. Until, at least, you see one in action. Bretons are naturally called to the magical arts and begin with a base resistance to magical effects. In addition, their Dragonskin power allows them to absorb half the Magicka from an enemy's spells once very day. They are also born with the ability to conjure a familiar. Speaking of Conjuration, Bretons have a +10 bonus to this skill, making them the best choice for Necromancers and specialists in the arts of summoning creatures. They also have +5 bonuses to Alchemy, Alteration, Illusion, Restoration and Speech. When you're dealing with a Breton, nothing is ever quite what it seems to be. From a role-playing standpoint, you can expect your Breton to get along reasonably well in Skyrim. Only the Altmer will be openly dismissive, and they don't like anyone. The Dunmer were the home race of the Morrowind entry in the Elder Scrolls series. Unfortunately, the intervening years have not been kind to them. Their outlook is nearly as dark as their skin, making the common name of their race especially appropriate. You will see outright hate for this race in the city of Windhelm, where they are allocated to the "Gray District;" in return, most of the Dark Elves your character will run into are similarly distrustful. Dunmer make great battlemages and spellswords; think of a warrior with a blade in one hand and a fireball in the other, and you'll have the makings of a happy Dark Elf. At least, as happy as they ever get. A Dunmer will have a +10 bonus to Destruction and +5 to Alchemy, Alteration, Illusion, Light Armor and Sneak. With an innate ability to resist fire and their Ancestor's Wrath ability, the Dunmer can actually cloak themselves in fire while setting flame to all those around them. The Imperials are the native race of Cyrodiil, the land featured in the previous Elder Scrolls game of Oblivion. In terms of stature, Imperials are hardier than Bretons are but less sturdy than Nords. In place of their traditional bonuses to personality-based skills, the Imperials of Skyrim have both increased luck in treasure hunting and the Voice of the Emperor ability. This ability allows them to calm nearby enemies of all types for 60 seconds. Imperials are the people of the Empire. Expect them to have some issues in dealing with the native Nords, especially those following the Stormcloak resistance. The Battlemage play style is well suited to an Imperial with his +10 to Restoration and +5 to One-handed, Block, Heavy Armor, Destruction and Enchanting. An Imperial can cast a Rune on the ground as a trap, and then sit back and wait for his enemy to approach. He will be well equipped to deal with anything that is able to get in range of him. 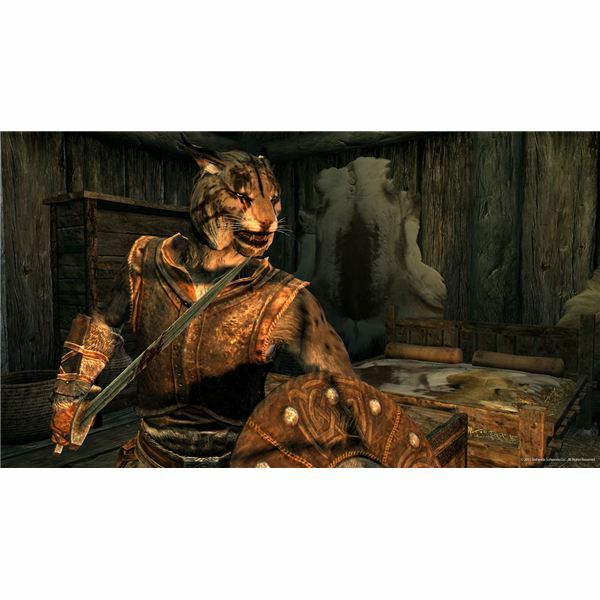 The poor Khajiit — the other playable beast race of Skyrim, Khajiit are nearly completely absent from within city walls. They are universally discriminated against and can usually be found just outside the city proper, peddling (probably stolen) goods and the highly addictive Moon Sugar while sitting around a campfire. Khajiit players will find that they have a difficult time interacting with most NPCs. For those who like to play a bandit or assassin archetype, the Khajiit is perfect. With a +10 bonus to Sneak and +5 to Alchemy, Archery, Lockpicking, One-handed and Pickpocket, he can take most of what he wants by either subterfuge or force. The Khajiit also has the Claws ability for a modicum of hand-to-hand damage, and is the only race that has access to the old Night Eye ability. The Nord is, of course, the human race native to Skyrim. These proud people are dedicated and hardy survivalists and make great pure warriors. 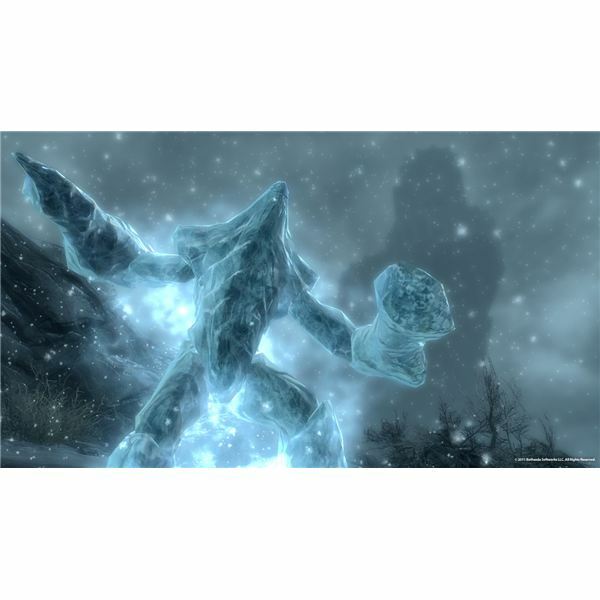 They are able to resist frost-based magic, due to their adjustment to Skyrim's climate, and they can cause enemies to flee from them once every day. The Nord player will have little problems fitting in and should enjoy easy interactions with most NPCs. Nords are born with a +10 to the Two-handed skill, along with +5 bonuses to Block, One-handed, Light Armor, Speech and Smithing. A Nord warrior can wade into battle with dual-wielded blades, one huge mace, or a sword and a board. Should he choose not to fight, he can probably persuade or intimidate his foes instead. The Orcs are thought to be descended from the followers of the ancient Aldmeri god Trinimac. 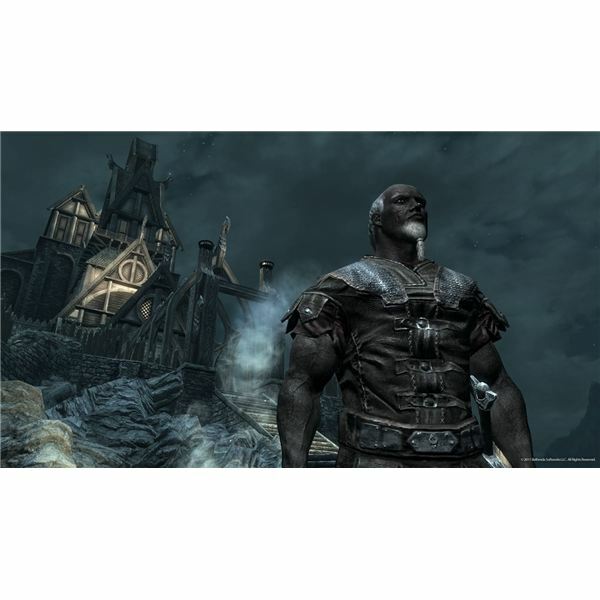 Upon Trinimac's defeat at the hands of Boethiah, he became known as Malacath. Malacath remains the patron deity of the Orcish race. The Orcs of Skyrim tend to shun the cities and reside mainly in a few different strongholds, scattered throughout the region. Orc players will be granted access to these strongholds; players of any other race will have to do a quest to earn their trust. The Orc is a natural berserker on the battlefield with his +10 to the Heavy Armor skill and +5 to Block, Enchanting, One-handed, Smithing and Two-handed weapons. Once each day, they are able to deal double damage while taking only half of the incoming damage themselves. The native race of both Hammerfell and the aptly named game in the Elder Scrolls series, Redguards are masters of weaponry. All members of the Redguard society are expected to develop skill in wielding numerous types of swords, axes, maces and other battle apparatus. While they are considered a human race, they are distinctly different from Nords, Imperials and Bretons on a biological level. The Redguards defied the Imperial-Altmer treaty called the White-Gold Concordat, and as a result, Hammerfell is no longer considered part of the Empire. For this reason, you can expect distrust and disdain from the Altmer and an easier relationship with those Nords who are active in the rebellion. Redguards are able to resist poison and use their Adrenaline Rush ability to increase Stamina regeneration once every day. They have a +10 bonus to One-handed and +5 to Alteration, Archery, Block, Destruction and Smithing.